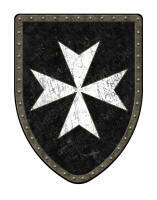 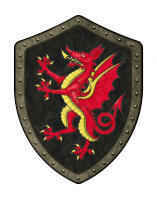 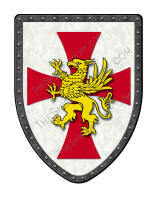 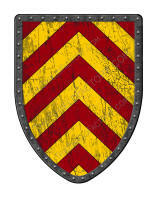 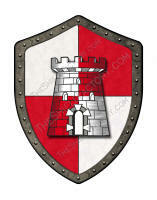 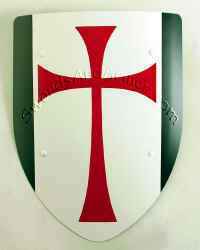 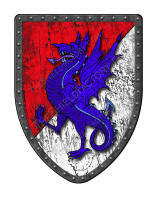 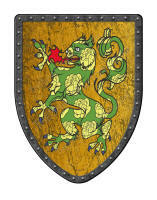 We stock medieval battle and display shield models of hundreds of styles. 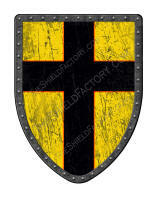 They are available as a hanging style or a hand-held battle ready style. 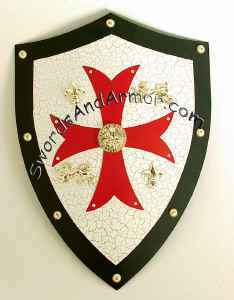 Shown below are just a few styles we offer. 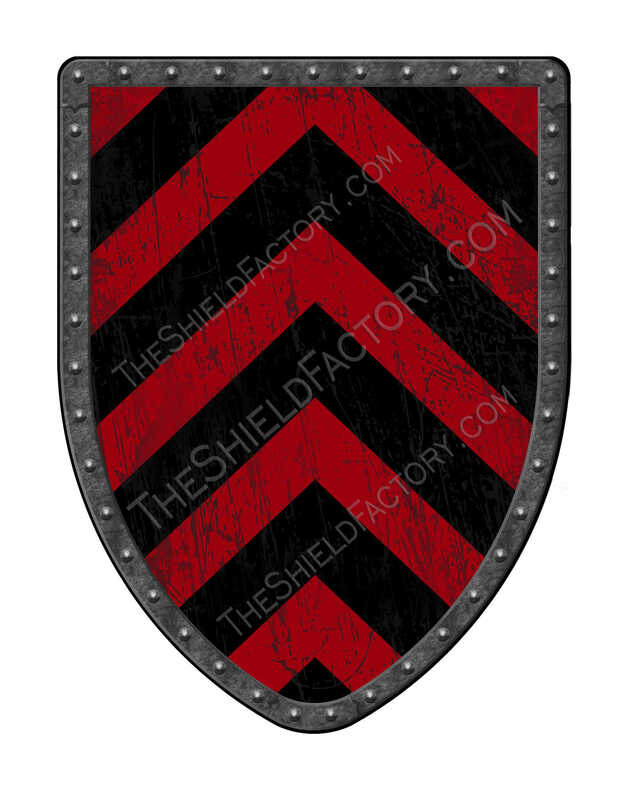 Most are hand made in the USA by www.theshieldfactory.com . The outer rim you see on the shields is part of the graphic artwork. 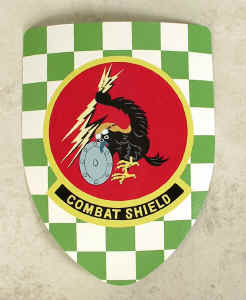 The Hanging Styles are SH503P-DG-HG and SH504P-DG-HG for the hanging type shield. They cost $145 each. 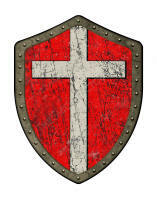 The Battle ready type has leather straps on the back. Style numbers on the battle ready are SH503P-DG-BR and SH504P-DG-BR and they cost $159 each. 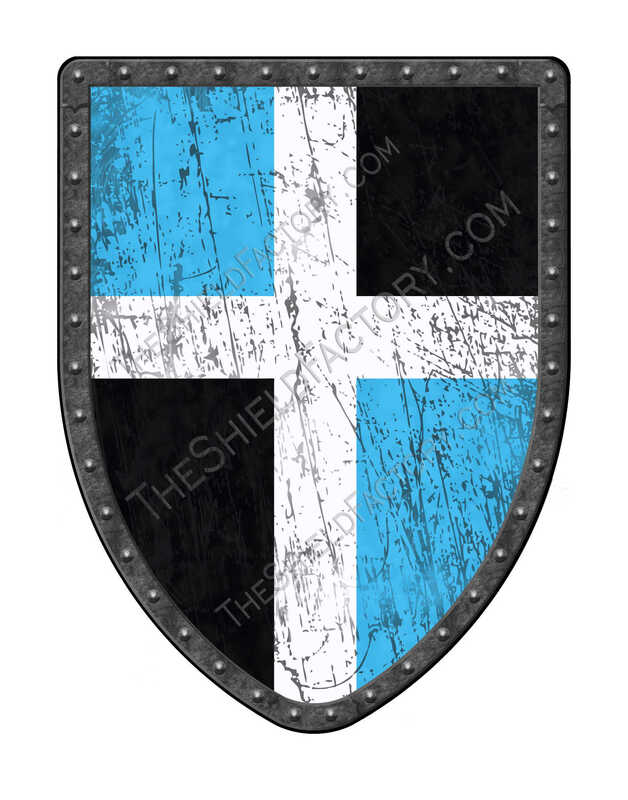 The shields are 18" x 24" and made of 16 ga. steel and have about 1 1/2 of curvature depth. 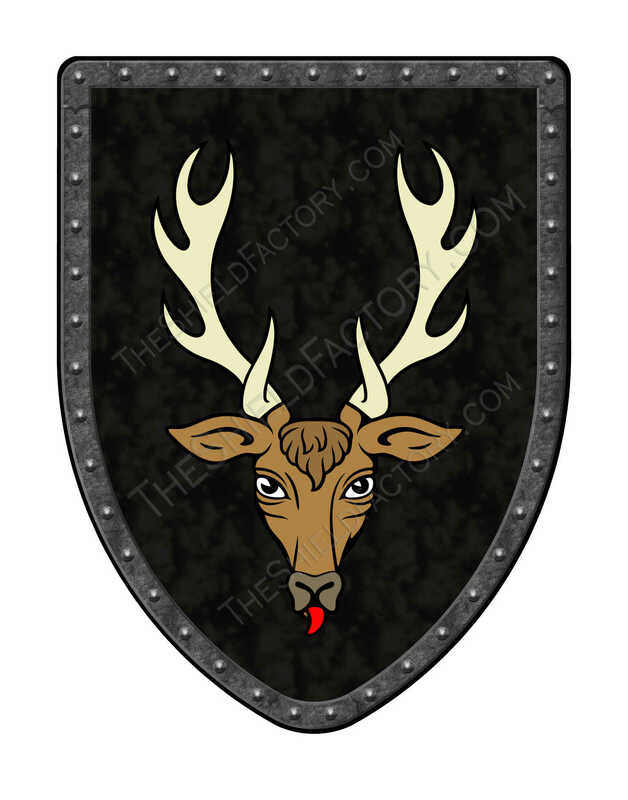 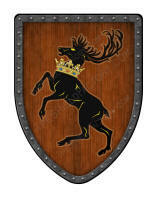 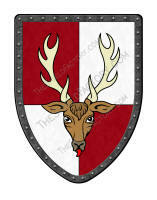 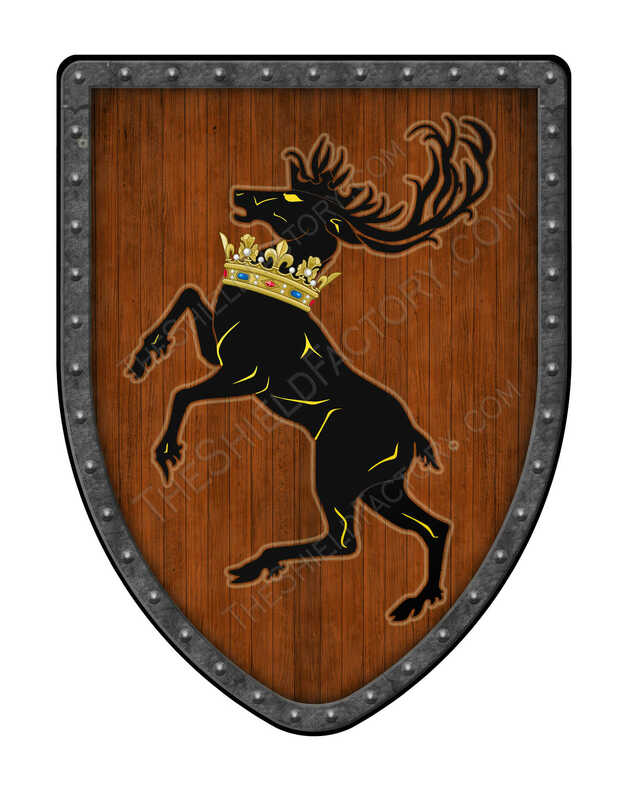 Custom Crests: We can custom make a piece from your original artwork. 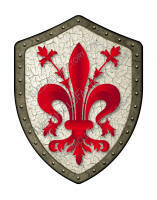 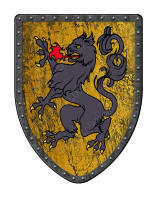 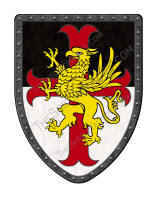 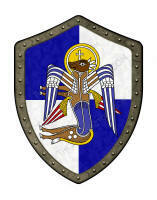 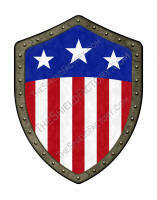 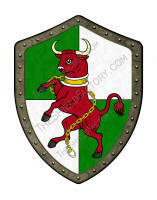 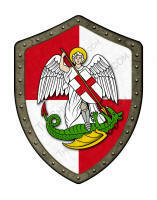 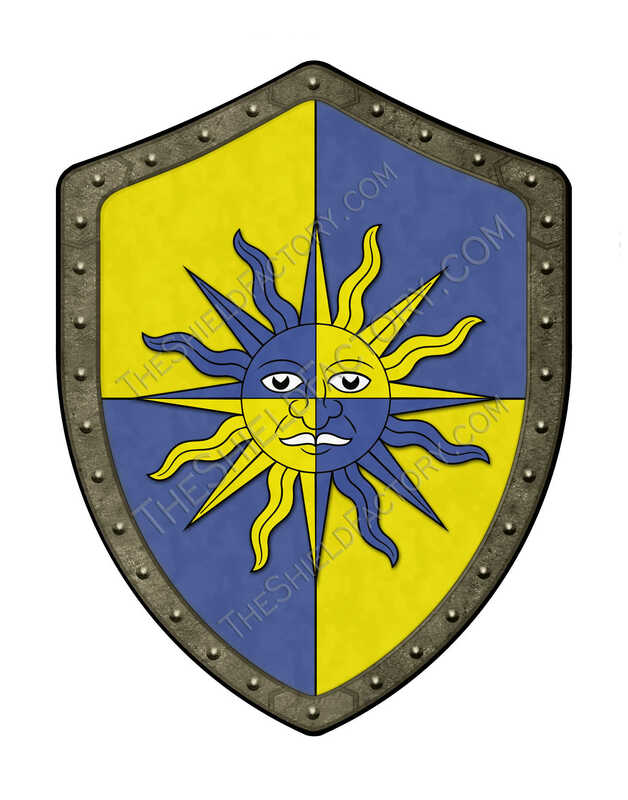 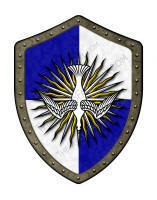 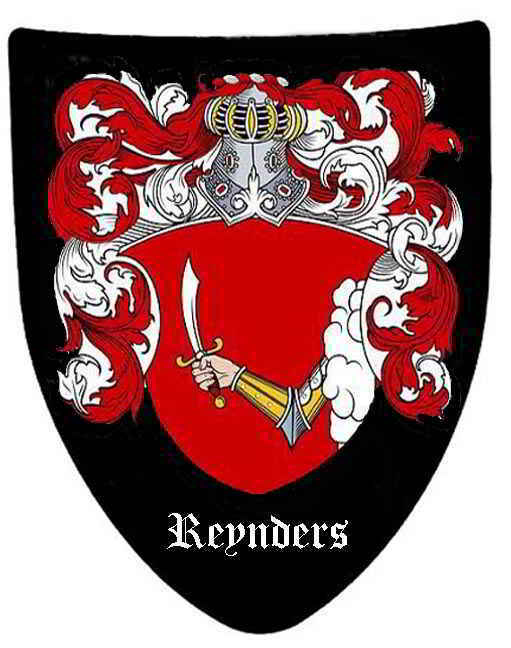 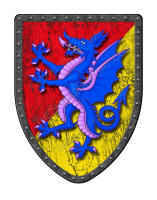 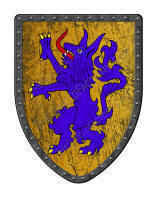 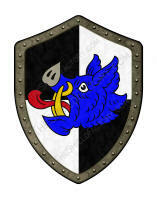 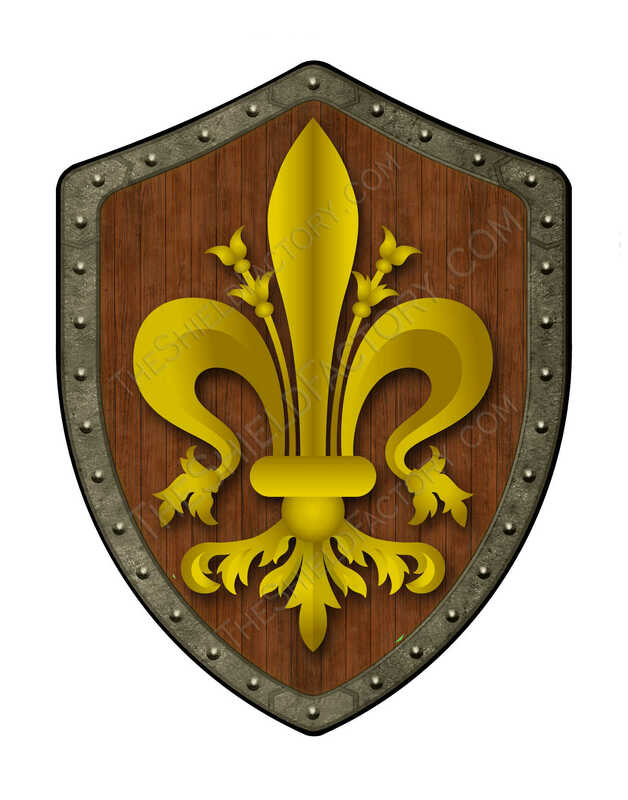 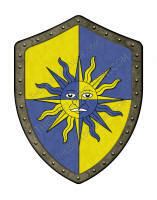 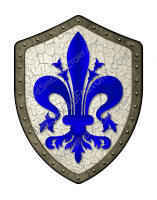 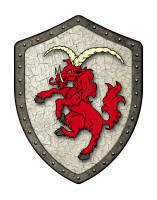 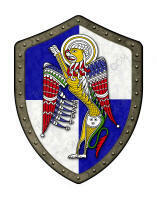 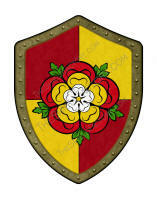 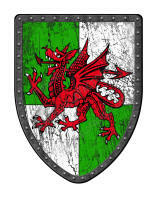 Just send us a JPG image of your crest or your colors for an accurate quote. We can generally provide 5-6 day turnaround on all custom made items. 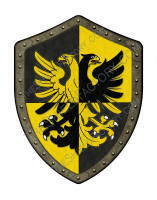 Choose from wall hanging types or battle ready with real leather straps. 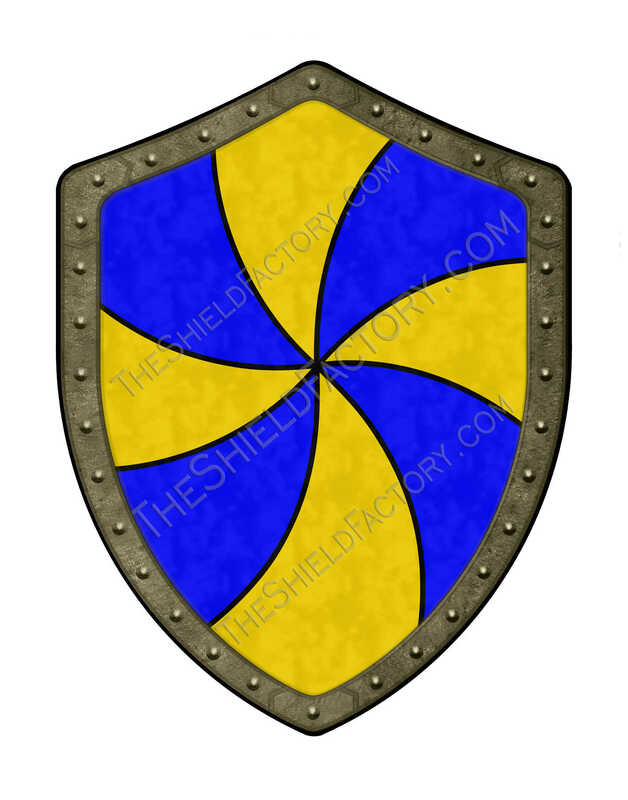 People have used shields since they figured out that something was needed to block or deflect blows from an enemy or animal. 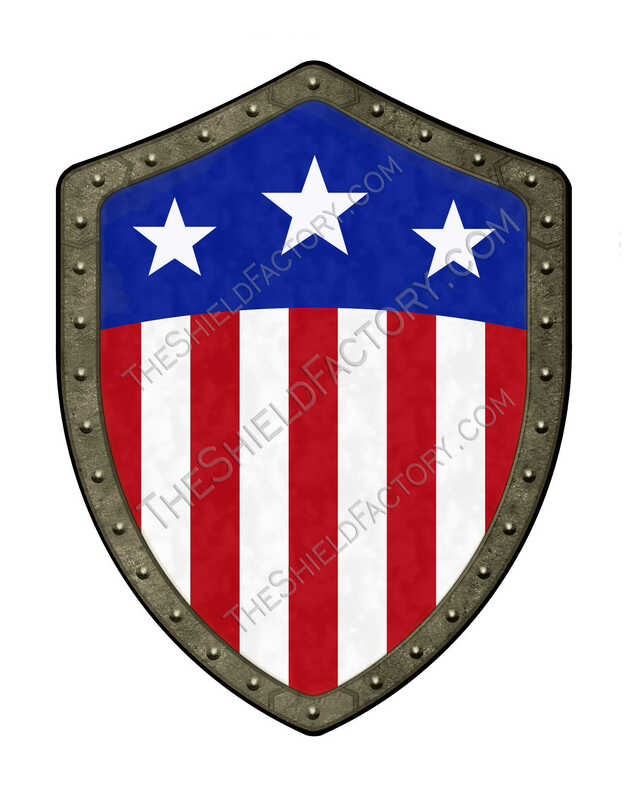 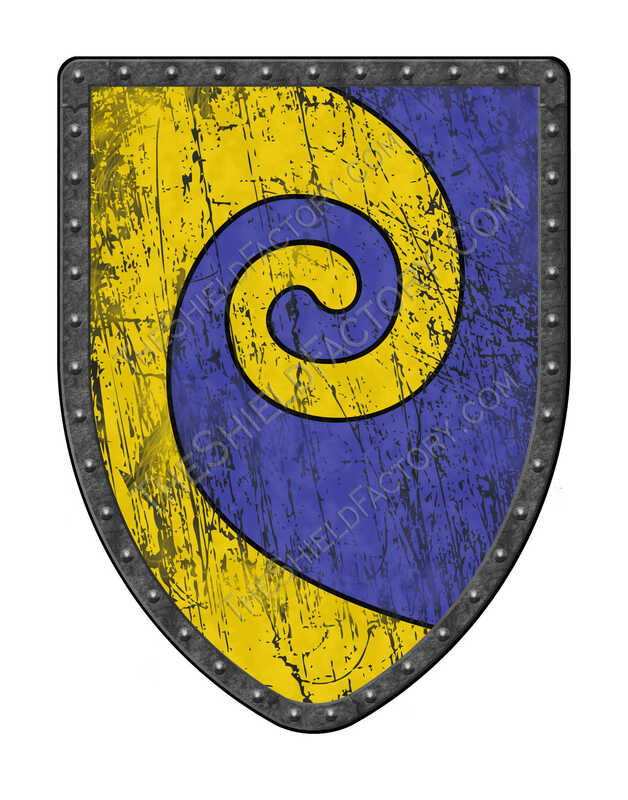 The shield was also a handy device to land blows on someone, or something, that was attacking in order to stun the attacker long enough to get some distance from them. The earliest shields were probably only strong enough to protect against a blowpipe, a slingshot or a rudimentary bow as they were made only from animal hides and wicker or reeds. 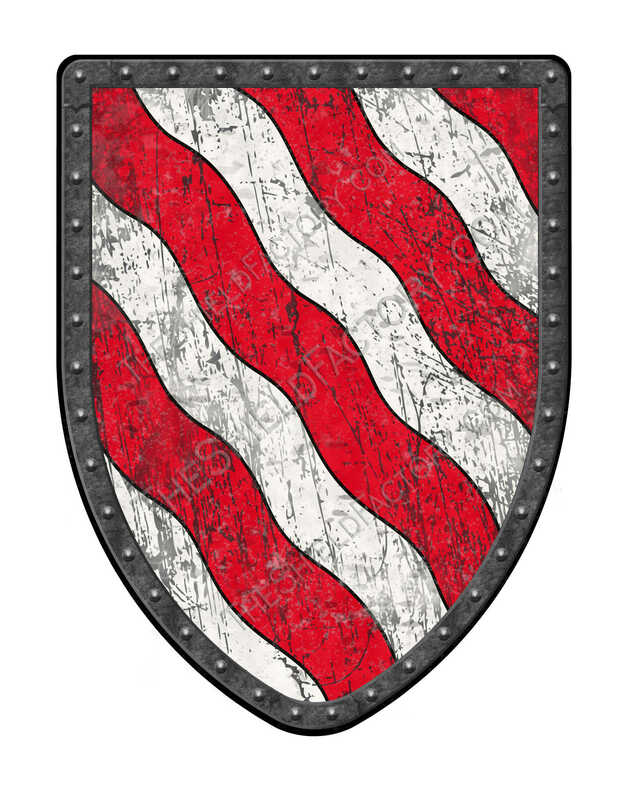 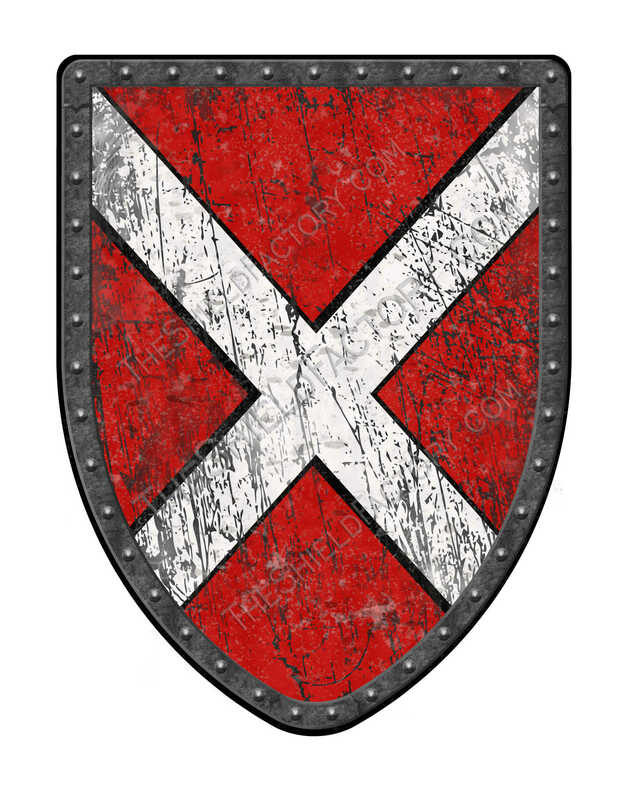 It is doubtful these early shields would have held up for very long against a raging bear or a manic intruder with a heavy stone in their hand! 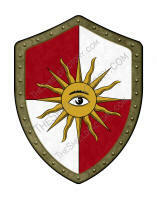 But people have always been very creative and improvements appeared as time passed, with all tools and weapons. Eventually, they used wood and rawhide which were much stronger. 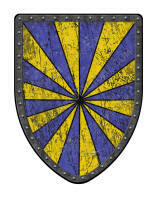 By the Middle Ages, the shield had progressed to all shapes and sizes with metal rims and supports and were mostly wooden or bronze. 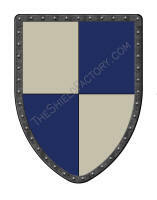 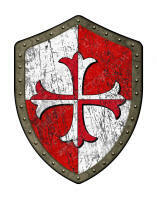 By the later Medieval Age, steel shields, having proved to be stronger and giving more protection, became the standard. By the time man began to organize himself into factions, these shields began to serve another purpose and that was one of identification. Because there was little uniformity in what a man used for armor, in a battle, it would have been very easy to mistake one of your own for the enemy. 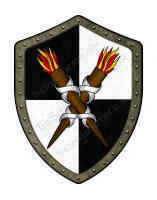 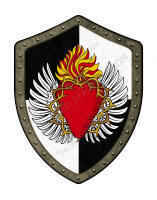 Different clans began to add their own symbols to the shields to differentiate themselves from their enemies. 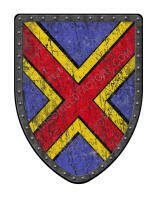 The use of Standards or flags were reserved for royalty but would reflect the same symbol that appeared on the shields of the common soldiers. 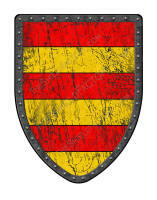 Simple designs such as the outline of an animal or lines painted in different colors were enough in the beginning but became more complex as time passed. 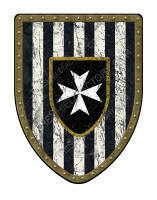 Some military standards were developed and used by more organized forces, such as the Romans but would reflect only the fact that they were Roman soldiers, unrelated to the Emperor. 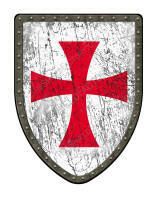 These symbols began to be used in the 12th century by the rulers and knights of Europe and were as varied as the country or tribes who used them. 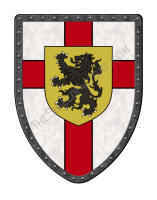 The Normans were the first recognized to have symbols that related to an individual, most notably Richard the Lionheart. 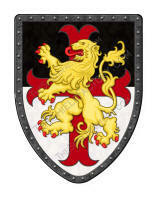 His famous lion which began as his Great Seal ( the seal of the ruler) with one or two lions became part of the National Coat of arms in variation all over the British Isles in the 17th century. 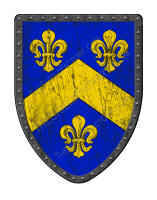 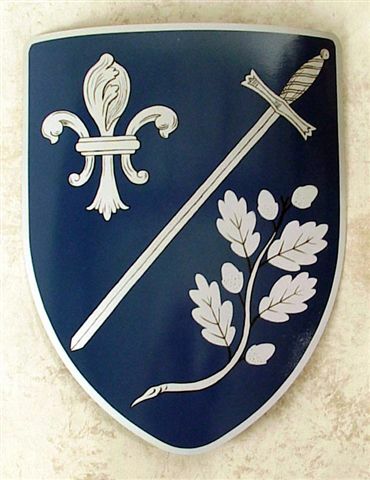 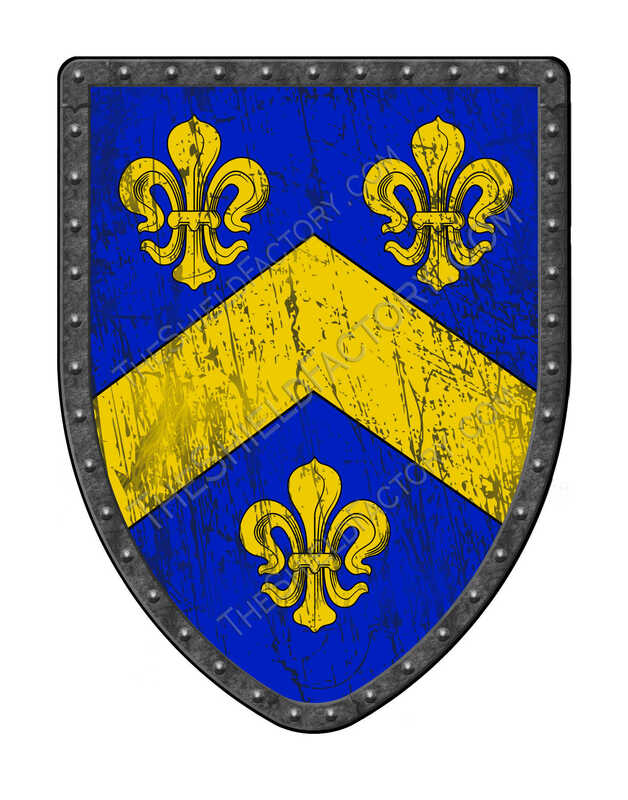 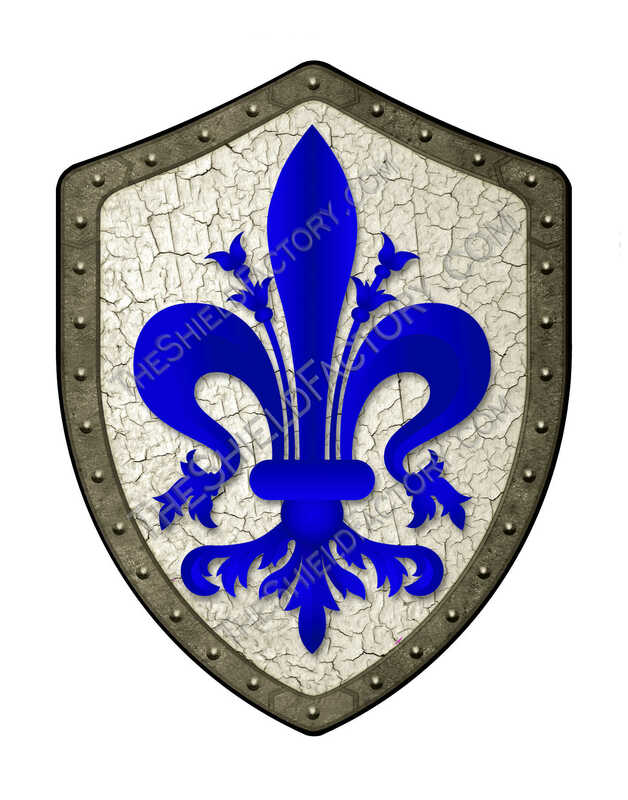 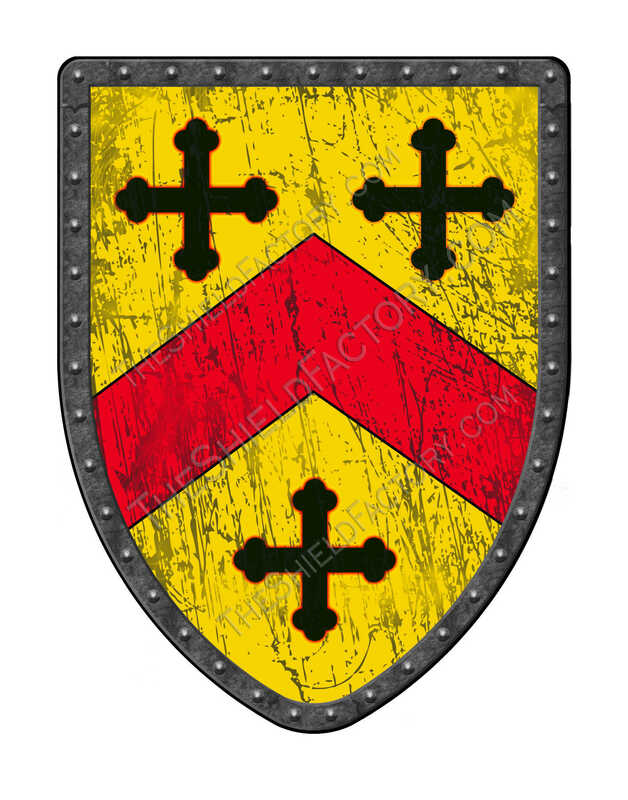 Over the next one hundred years, these battle shield symbols began to graduate into society, to distinguish the various noblemen and families of the higher social orders in Europe as, on the battlefield, they were recognized as a particular family’s emblem. The designs became more ornate and began to take on the personalities of the families, their occupations and their achievements. Who was allowed to have these was dictated by social custom, sometimes by law, in the different countries. 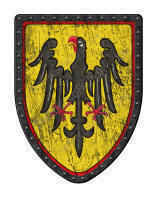 In Germany, noble houses, merchants and other free citizens were allowed to have a coat of arms, where in most of the rest of Europe, it was restricted to the Noble Houses. 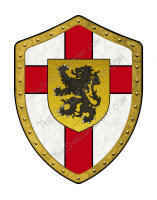 In the British Isles, coat of arms usage was strictly upheld and given only to individuals. 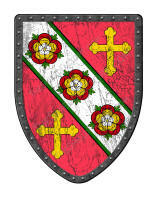 These were awarded by the King and lesser rulers under the King’s auspices, usually for service or recognition of status under a particular King’s authority. 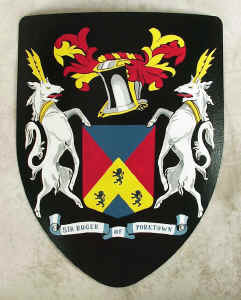 These coats of arms were inherited but had to be changed each time to reflect the status of the new owner and how he related to the original individual. 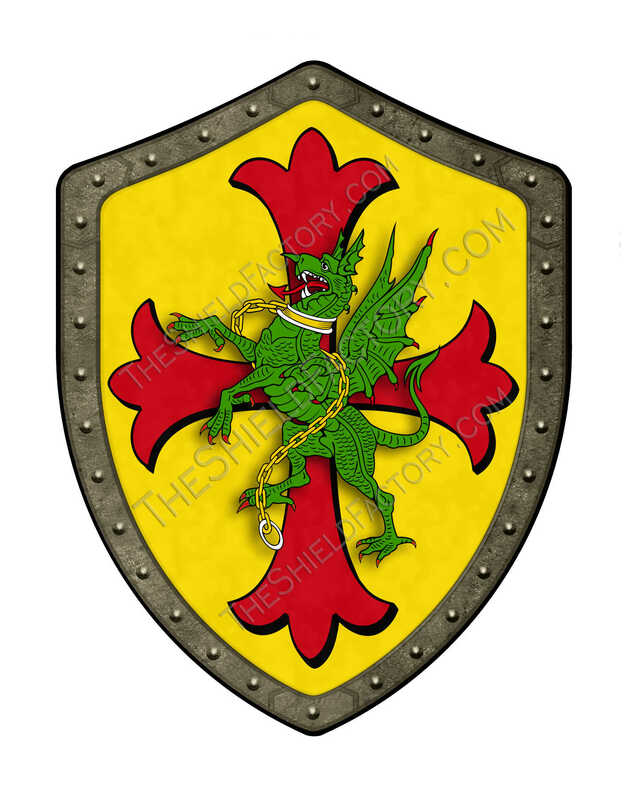 The designs used have been kept very traditional through the centuries and tell a story that can be read by anyone who has a grasp of the language of Heraldry. 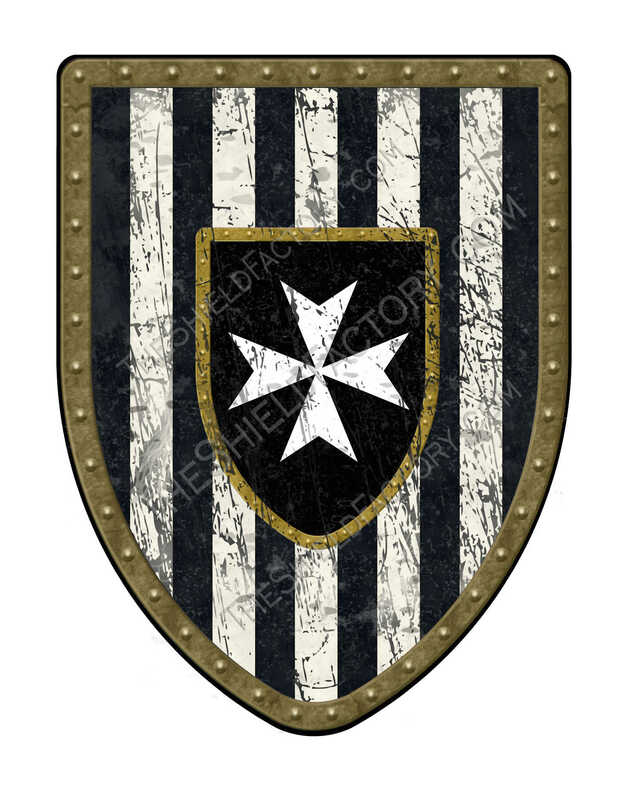 Coats of Arms were awarded and were a great honor to receive especially when they were first used in the early centuries of their existence. It told a story of a person’s journey of earning his title, his lands and his deeds. Every element on those shields has meaning, even down to what the viewer’s eye sees only as a dot; even the colors used tell a story. 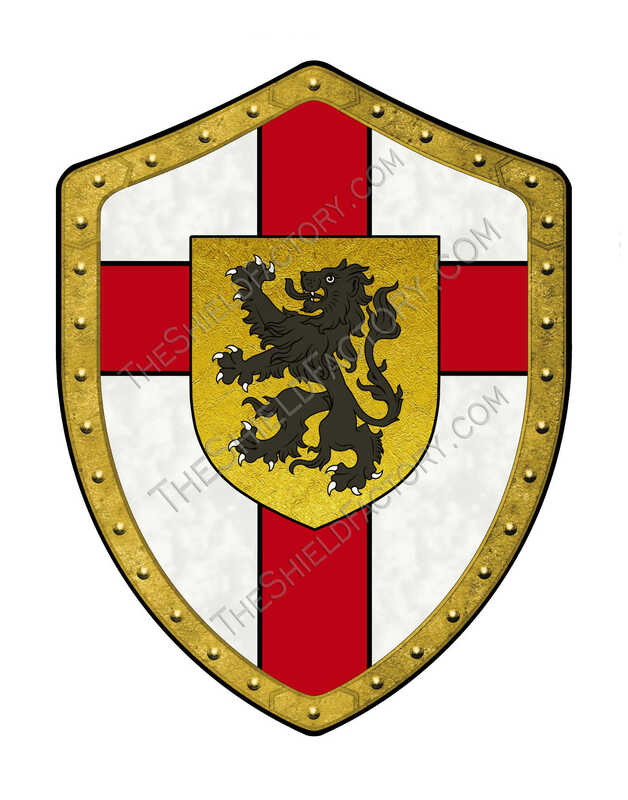 Families would take those shields and pass them down, remembering the original owner and their mighty deeds, able to tell that person’s story from what was portrayed on it and would adapt it as their own by adding or deleting a detail. 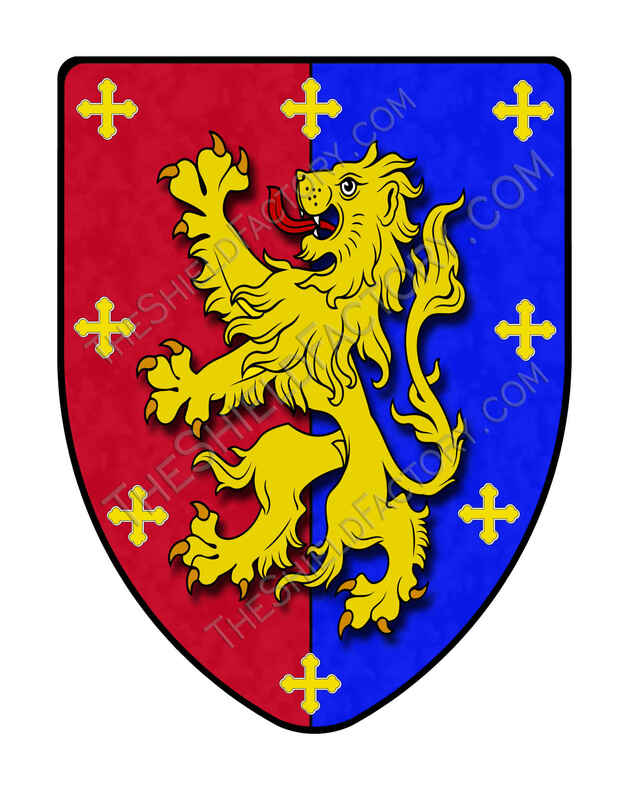 This language of heraldry was able, with a single symbol, to tell who had bestowed the honor upon the person and if it was the simple hallmark of a minor lord who acted as a landlord for the local Baron or a reward from the King Himself for exemplary service to the King. 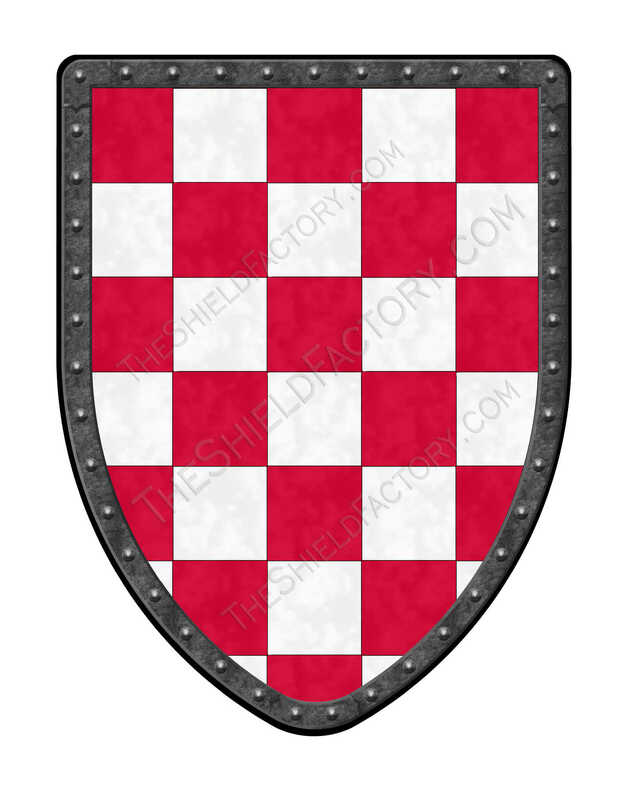 A knight’s shield could tell the story of an important battle in which he had distinguished himself and earned the King’s gratitude. 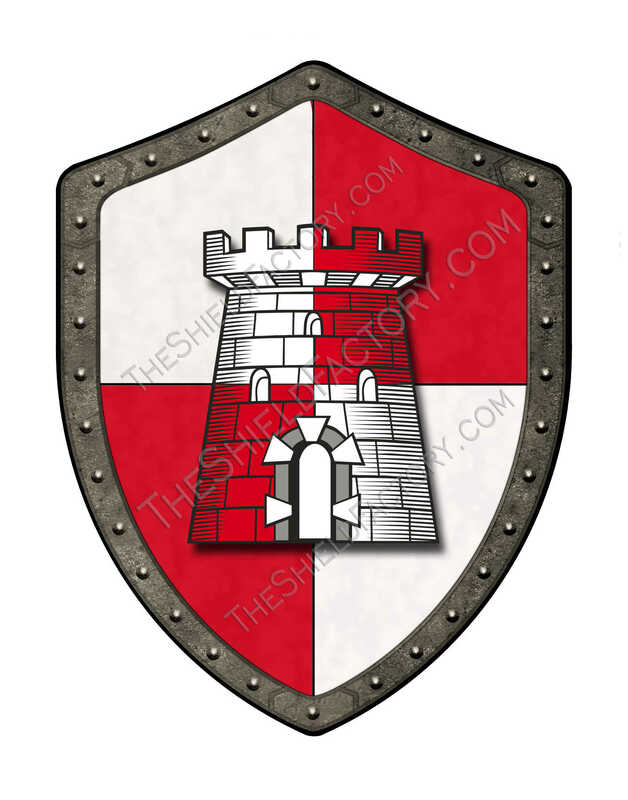 Since pictures were more easily decoded than the written word for generations, most knew when they stood in the presence of a Duke or a Baron’s guardsman by simply looking at the crest on the shield. They could easily read the awards, the rank and where that person had been in battle and won his recognition by studying the designs of an individual knight or lord. 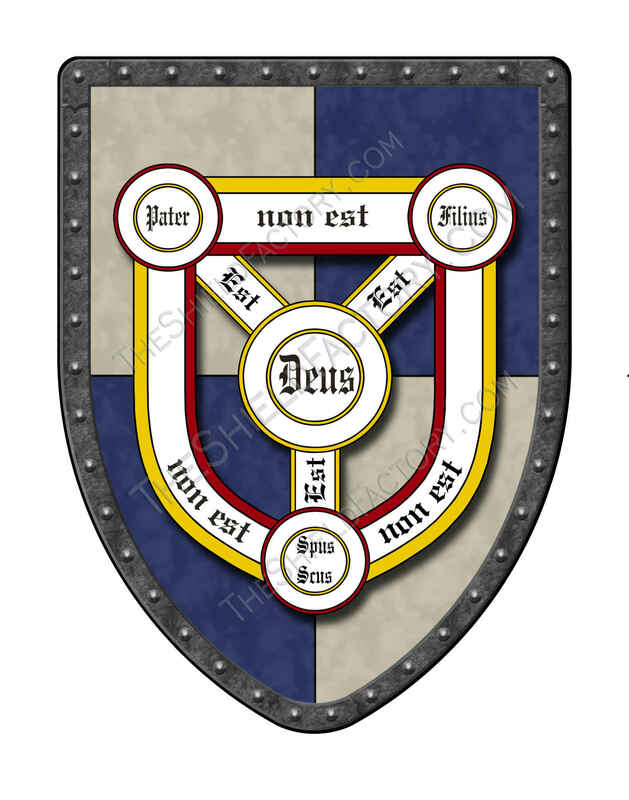 And many, who may have been illiterate in written word, would know immediately who stood in front of them simply by studying the coat of arms displayed on uniform and shield. Today, many families still desire to find a coat of arms in their family’s history and may no longer have one being passed down through their family as generations separate them from the time of the King’s recognition or their ancestor of more ancient times and their recognized accomplishments. The fact that these shields changed with each generation has also made it hard for people to know which shield belonged to their particular ancestor especially if several countries are involved. 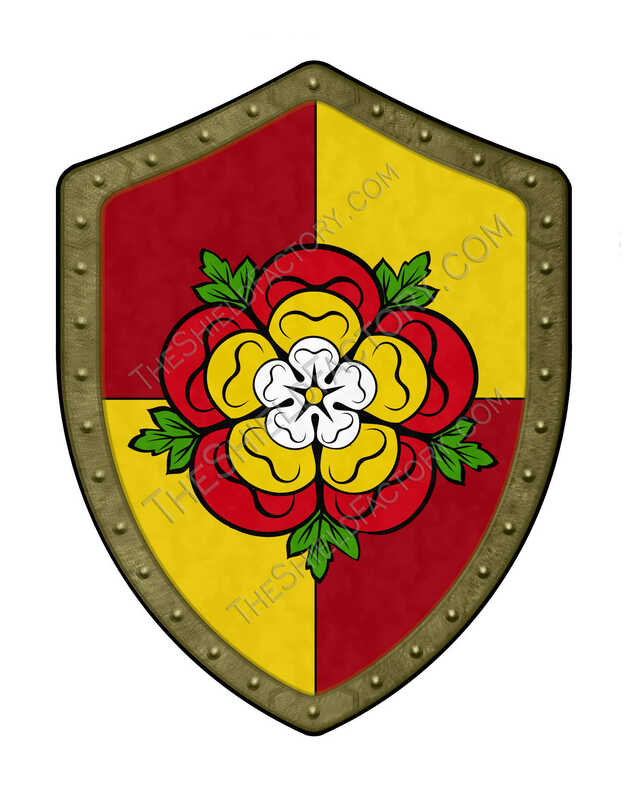 Genealogy research is very popular now with the ease of the internet and it is easy to latch on to a particular coat of arms with no real basis of knowing if that is the one of your own ancestors. Our sense of wanting to belong to our history is very much alive and needed in our transient world. Some families and individuals continue today to create their own coat of arms. 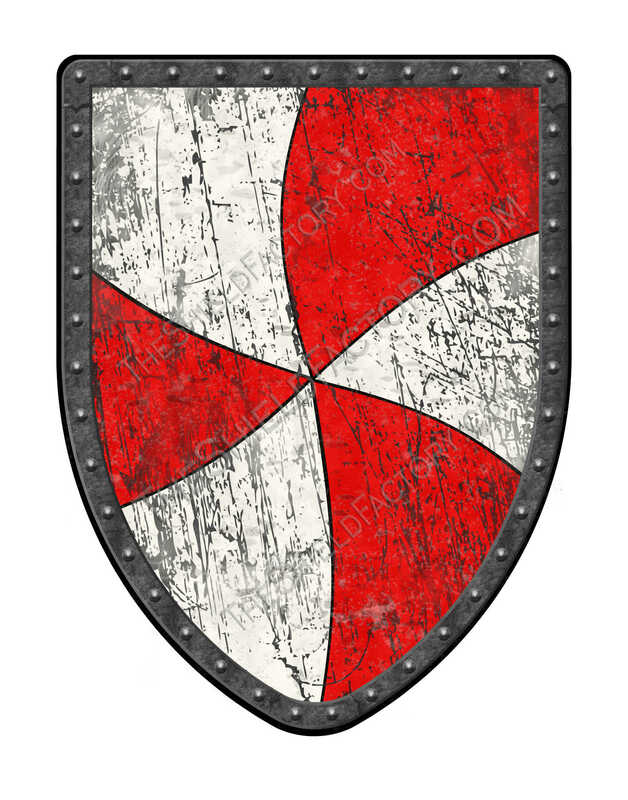 Those who participate in re-enactments often design their own shields and as a company that supports this, we often see patterns that fascinate us as the imagination and artistry that first created these emblems continues its own tradition in the hearts and minds of the modern generation. Families take the elements from older shields and design their more contemporary interpretations of past generations. 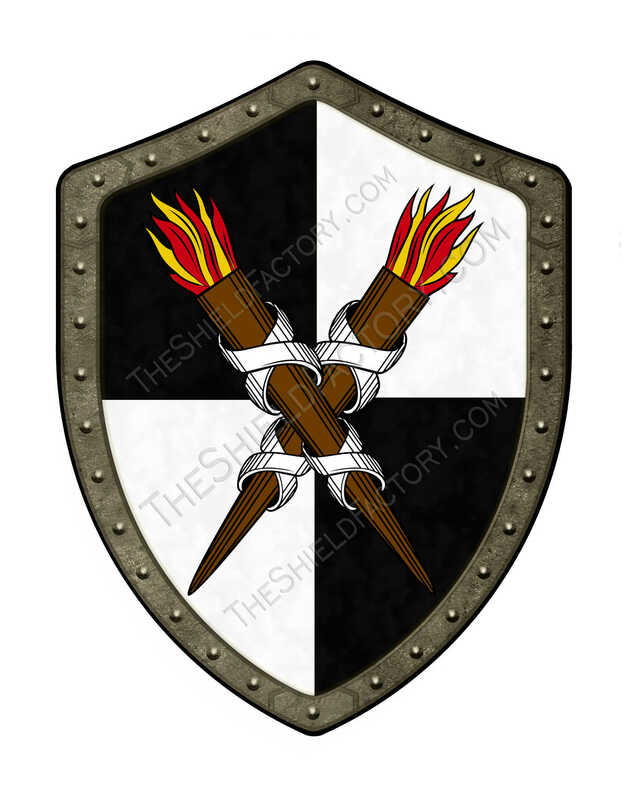 Although less traditional and not awarded, these creations are no less important to those who own them, as it is a symbol of who they are now, as a family and as an individual. It appears that the tradition and the need to record individual deeds and family solidarity remains the same even after a thousand years of use and is just as fascinating as its earlier counterparts. 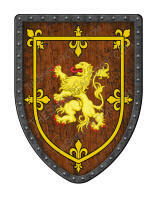 Our collection of medieval shields, custom family and court crests is the largest available anywhere. We stock over 35 different styles of shields and can custom design anything for you. 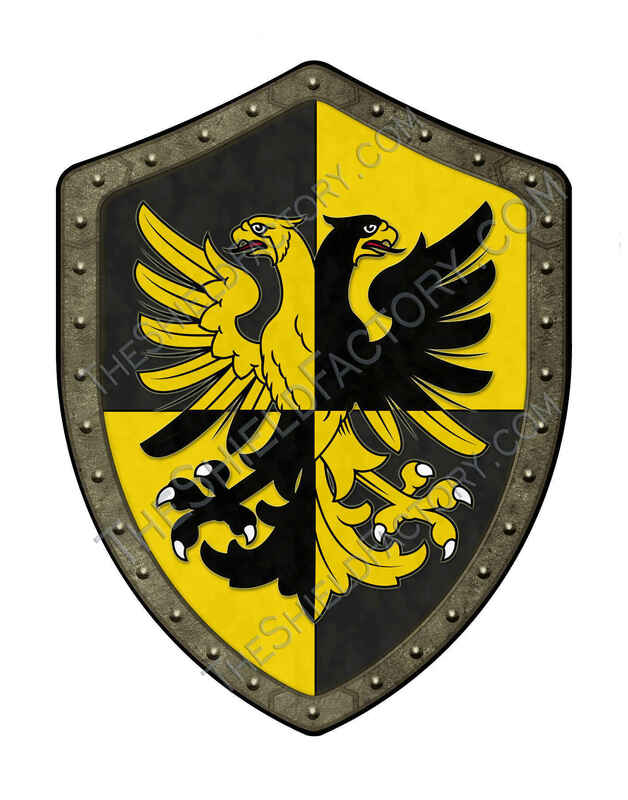 No family crest design is too complex. Battle ready shields are also available for combat re-enactments and clubs. 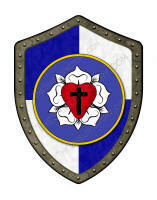 We welcome SCA members ideas and input to further develop our product line.